Successfully Added 4 Port USB 3.0 HUB to your Shopping Cart. Expand a single USB 3.0 port into 4 full speed USB 3.0 ports with this lighting fast 4 port USB 3.0 HUB. Imagine being able to transfer an entire DVD to your USB thumb drive in less than 10 seconds. Or how about an entire high definition Blue-ray movie in less than a minute. Well, the wait is finally over thanks to this USB 3.0 HUB with transfer speeds of up to 5Gbps! Don’t have a USB 3.0 port on your computer? Not a problem! Simply order this product together with our CVTA-K112 USB 3.0 PCI card for desktops, or the CVTA-K113 USB 3.0 Expresscard Adapter for laptops, and in a few short days you can finally enjoy amazingly fast USB 3.0 transfer speeds. For less than $20 you can easily add 4 high speed USB 3.0 connections to your existing USB port. Hurry and order this product now while supplies last and we will ship out your order within 24 hours and even include our full one year warranty. 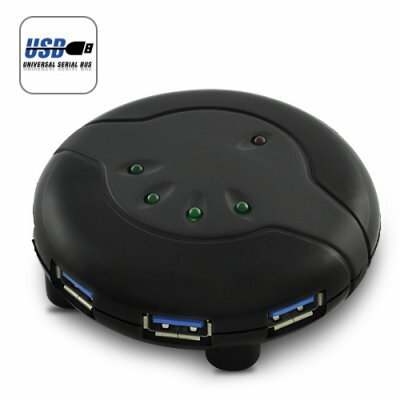 Excellent Resale Item, our price on this 4 port USB 3.0 HUB is lower than anywhere else on the internet!